owners who manage multiple Google Site Search engines! You can now share query quota between paid GSS and free Custom Search engines. This may be useful for you if you pay for a quota with Google Site Search and you’d like to share that quota with your Custom Search engines. To do this, add those extra engines to a “business group” to share the quota. To add CSEs to a business group, visit the Business Group page of your GSS’s Control Panel. Click Add and you’ll see a list of the free CSEs that you own or that have been shared with you. Select the free CSEs you wish to add and click OK. All group members will immediately share the quota of your GSS. We hope you’ll find this much easier than trying to estimate your quota needs for each of your individual search engines. To learn more about Business Groups, please visit our help center. Let us know what you think in our discussion forum. 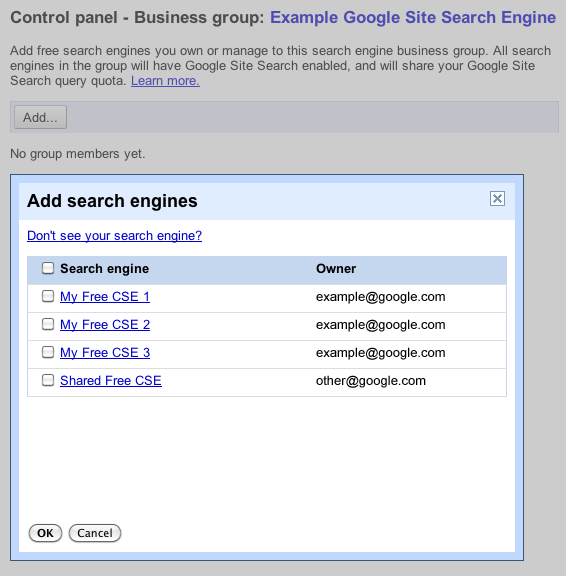 Good news for Google Site Search owners who manage multiple Google Site Search engines! You can now share query quota between paid GSS and free Custom Search engines.